Retired high income couples are more likely to grow their wealth during retirement. However, when one member of a couple dies the wealth of the survivor drops significantly and their wealth continues to fall for the rest of their lives. To understand the differences in saving patterns, the authors estimate a model where households face realistic health, medical expense, and mortality risks estimated from high quality US data tracking the same households for 18 years. This provides a ‘laboratory’ to vary features of household’s economic environment to better understand why they make these decisions. According to the research, a key challenge is that the same savings that can be used to pay for medical spending or other contingencies can also be used to leave an inheritance. This makes it difficult to understand which of these savings motive is more important for retirees. The researchers consider the different risk that households can face. For example, to understand how large these risks are for retirees, imagine a couple where the man is age 70. On average, the woman will live for another 15.8 years while her husband will only live for another 11.5 years and the oldest survivor will have lived for 17.9 years. However, these averages conceal large differences across the population. High-income people live longer than low-income people: an otherwise identical person with a high lifetime income would live for another 2.5 years compared to someone at the bottom. Married people also live longer but are typically in better health at age 70. Around a third of women and a fifth of men have a long nursing home stay during retirement and these stays have large costs. Expenses also increase around death. 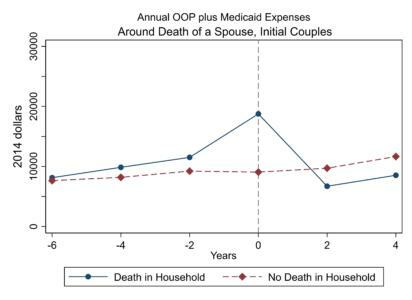 On average annual medical (including out of pocket and Medicaid payments for both medical and social care) and death expenses double when the first spouse dies and, while they drop afterwards, survivors’ face continuing high medical costs. This is shown in Figure 1 below. The researchers devise a model of saving decisions, taking account of the types of budgets households face, including government means tested programs for health and social care. This includes Medicaid which pays for catastrophic health and social care in a similar way to the UK system. They simulate a world in which households no longer have out of pocket medical expenses including paying for long term care. The researchers find that low-income households would choose to save more as now anything they save to leave as an inheritance will be received by their heirs. For couples there is an added desire to leave enough money behind so that the survivor can enjoy life after they die. In contrast, high-income singles spend more and reduce their savings because they no longer worry about receiving a large medical spending bill. Where elderly households do not care about leaving anything to their heirs, they find a very different pattern of saving. Single households spend their money while they are alive with most of their wealth spent by the time surviving households reach their early 90s. For singles in this experiment any money not spent when they are alive is wasted. In contrast, the study finds that low-income couples increase their wealth. At the age of 70 it is likely that one of them will still be alive in 20 years and they want to make sure they don’t leave their widow impoverished. Higher-income couples reduce their wealth, but much less quickly than single households and still have $200,000 in assets by the age of 96. “Couples’ and Singles’ Savings After Retirement” by Mariacristina De Nardi (Federal Reserve Bank of Minneapolis, UCL), Eric French (UCL, IFS), John Bailey Jones (Federal Reserve Bank of Richmond) and Rory McGee (UCL, IFS) is presented at the Royal Economic Society annual conference in April 2019. Disclaimer: The opinions and conclusions are solely those of the authors, and do not necessarily reflect the views of the Federal Reserve Bank of Minneapolis, the Federal Reserve Bank of Richmond, or the Federal Reserve System.